Archaeologists excavating a pyramid complex south of Cairo, Egypt have made a phenomenal bulk discovery: eight ancient mummies dating back over 2,300 years. Announcing the fascinating find, Egypt‘s Ministry of Antiquities revealed that eight coffins had been uncovered in the southeastern area of King Amenemhat II's pyramid in Dahshur Necropolis. The mummies, three of which are in good condition, date from the Late Period of ancient Egypt and are “covered with a layer of painted cartonnage in the form of a human,” the ministry said. Cartonnage is a material frequently used to cover mummies, usually made from linen or papyrus and plaster. 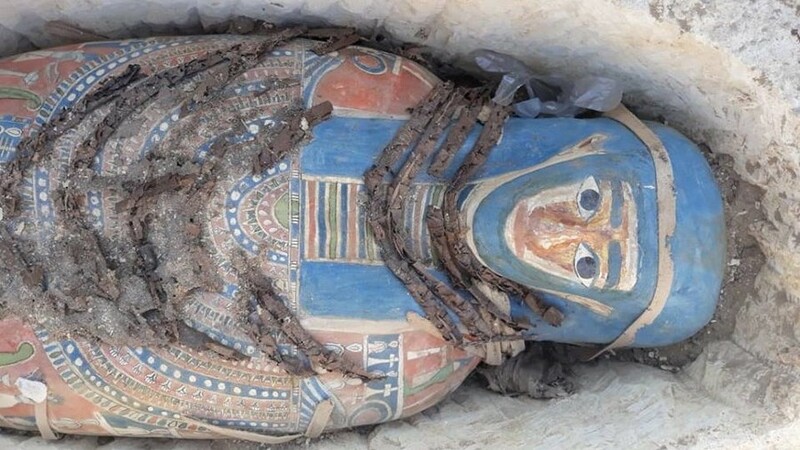 The mummies and their entombing limestone sarcophagi will eventually be put on display at museums scheduled for tourist resort hubs like Hurghada and Sharm el-Sheikh. The Dahshur complex has been a fascinating site for archaeological excavation thanks to its reputation as a resting place for kings and royals. Last year the remains of an Egyptian pyramid built some 3,700 years ago were uncovered.